A baby tooth is smaller than an adult tooth, therefore decay will spread more quickly. To address decays on your child’s teeth, a filling will be administered after a comprehensive clean. 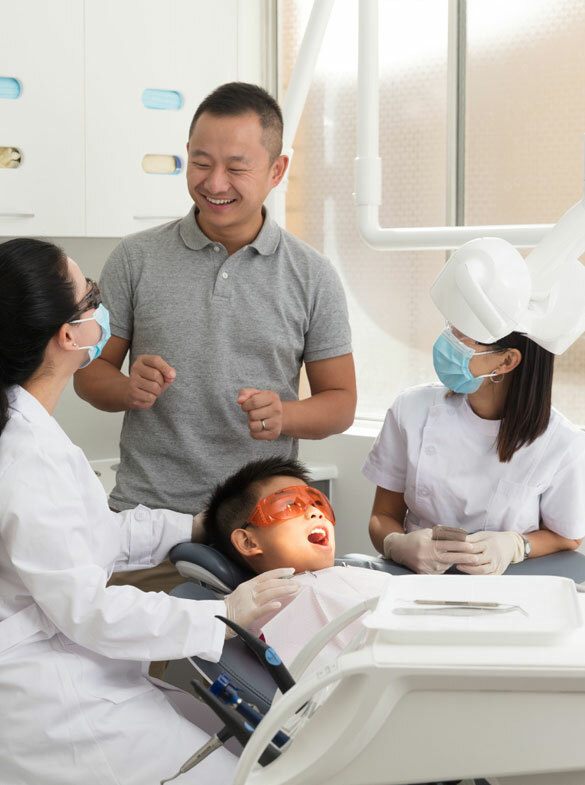 However, in most cases, a filling is not protective enough for the tooth and medium-large fillings on baby teeth are vulnerable to bacterial infections. To remove the chances of decays, stainless steel crowns and pulpotomy treatment can be administered. A crown is a tooth-shaped “cap” which is cemented to the remaining part of the tooth’s structure to protect the underlying tooth and retain the tooth’s function. These crowns, composed of the strongest restorative material available for immediate placement, are performed, sealing the tooth structure to protect the tooth from further damage. It can be used to seal fillings or pulpotomy treatment, where the targeted tooth is the weakest from the treatment. The crown will act like a helmet to prevent the tooth from further damage as well as minimizing the risk of recurrent decay. Pulpotomy, is a root canal treatment which involves the removal of damaged nerve tissue in the roots of the baby tooth. When decays extend and lies deep within the roots, the infected nerve tissue is required to be removed before a stainless-steel crown is placed over it for protection. This treatment is complex method of saving the tooth, however if the decay has completely infected the tooth, extraction may be conducted to prevent further bacterial infections from spreading to adjacent teeth. If the tooth is removed/ fallen out, space maintainers are available to maintain an adequate gap for the permanent tooth to erupt. To avoid decays from developing and bacteria from wearing down your child’s teeth, it is important to monitor your child’s oral cleaning. Ensure they are brushing their teeth at least twice daily, flossing in between teeth, and maintaining a healthy diet (without excessive amounts of sugar and salts). It is also important to come into our clinic for a professional and comprehensive scale and clean to address any potential at-risk teeth and a thorough clean. Call 02 9051 2828 or visit www.360dentalcare.com.au to book an appointment.